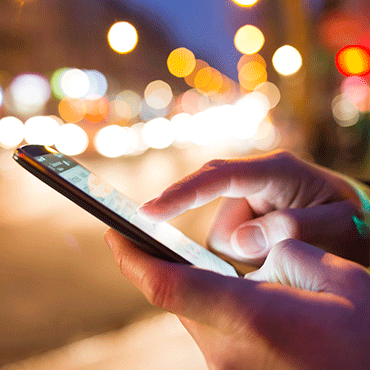 "Location, location, location" is a truism associated with residential real estate. What we're hearing from our construction contacts could be another sort of truism: "Labor, lumber, lots." They are referring to the ongoing tight labor market in the construction trades, the skyrocketing price of lumber, and the difficulty of obtaining lots on which to build. While it's true that housing sector fundamentals—employment growth, household formation, tight inventory—continue to support an optimistic outlook, our industry contacts continue to report challenges regarding the supply chain. This post will focus on lots in the Southeast. Data from MetroStudy indicate the supply of vacant developed lots in the Southeast has steadily declined since 2011 in absolute number and relative to housing starts (see the chart). While the current lot inventory appears similar to 2005 levels, there may be important differences. Anecdotal information indicates that lots are quite scarce, especially in desirable locations. That is, while the number of lots seems healthy, many of the lots developed from 2005 through 2007 were "bubble" lots—they have inferior locations and would not have been developed if not for the frothy environment of the time. When landing in Atlanta, for example, you can see scores of lots around the airport ready to go vertical, but being in the landing path of one of the world's busiest airports does not make the location exactly "prime." So, the number of lots may be overstated, and the need to develop lots in better locations persists. We heard of one possible roadblock from our business contacts. In the Atlanta Fed's most recent Construction and Real Estate Survey, the majority of builders continued to report that the amount of available credit for construction and development was insufficient to meet demand. The difficulty in obtaining bank loans, a traditional source of funding for small developers, has made it challenging for them to convert raw land to buildable lots. Given the comments on the survey, it seems somewhat surprising that, according to bank call reports, construction lending remains the highest growth portfolio among banks headquartered in the Atlanta Fed's district (which encompasses Alabama, Florida, Georgia, and sections of Louisiana, Mississippi, and Tennessee). Exposures for construction have risen steadily over the past three years as optimism about the economy has increased (see the table). In 2005, before the banking downturn, over 80 percent of the banks in the district were reporting construction loan growth year over year, with median growth rates exceeding 40 percent. From the time of the banking downturn through the early recovery, however, construction loan growth turned negative. Banks experienced significant losses on partially finished projects, making them hesitant to lend on other projects. Growth finally turned positive again in 2014. From 2015 to 2017, the percentage of banks reporting year-over-year growth in construction increased slightly, from 61 percent to 65 percent. Still, the percentage of banks reporting growth in their residential construction portfolio has declined slightly while the overall growth rate of construction loans has dropped from 20 percent in 2014 to just over 13 percent as of December 31, 2017. Looking deeper into the primary drivers of loan growth, we broke down total construction lending into two categories: Residential 1–4 family construction loans and Other loans, all land development, and other land. Though the Other category includes all land development, it mostly includes only construction loans for nonresidential and multifamily properties. Loans for development of lots that will have one to four family houses built on them are routinely put in the Residential 1–4 family category of construction loans. What this means is that the data cannot tell us the amount of lending going to develop new lots. What the data can tell us is that overall construction lending is growing, though at a measured pace and starting from a relatively low level. And anecdotes tell us that the growth is not coming from lot development loans, but, rather, commercial real estate projects and "vertical" residential construction—that is, the actual building of houses. It is worthwhile noting that, as construction lending growth has progressed, construction as a percentage of capital has drifted towards the point such that the median level for all banks is approaching precrisis levels (see chart). So while construction loan growth is strong, our industry contacts continue to tell us that not much of that money is going toward lot development. Recent Senate action may make regulatory capital constraints less of a concern, so the smaller community banks in the district may increase construction lending. However, given conversations with banking experts, it does not appear that banks' appetite for lot development loans has improved much since the crisis. Lots likely will remain relatively scarce, and our contacts will continue their lament of "labor, lumber, lots." The recently enacted Tax Cuts and Jobs Act of 2017 substantially reduced corporate taxes, from 35 percent to 21 percent. Some commentators and practitioners have voiced concerns about how the new tax law will affect demand for Low Income Housing Tax Credits (LIHTC), America's primary mechanism for producing new or refurbished affordable housing units. According to Dawn Luke, chief operating officer with Invest Atlanta, the lowering of the corporate tax rate continues to present challenges to the market in terms of LIHTC pricing, with credit prices being lowered by as much as 16 cents on the dollar for projects in the near-term pipeline. Luke says this means that several affordable housing projects could become bottlenecked as developers scramble to find subsidy to fill this gap. In addition, this firm expects that declining demand for LIHTCs will generate 20,000 fewer low-income housing units a year, a roughly 15 percent decline. Due to the rental restrictions, it is virtually impossible for LIHTC properties themselves to generate enough tax liability to claim the full value of allocated tax credits, so developers need to have either sufficient other federal income tax to offset or the income tax of a limited partner. These outside investors, usually organized through a partnership called syndication, would contribute a fixed dollar amount to the developer upon completion of the subsidized property in exchange for 99.9 percent of the equity, including allocated tax credits, of the project. The allocated tax credits themselves offer a dollar-for-dollar reduction in future tax liability, so changing the corporate tax rate does not directly reduce their statutory value. So why might the after-market value of the credits fall with the new tax law? First, the recent tax cuts reduce the pool of firms with sufficient tax liability. If a business has less tax liability than it has tax credits, that business would effectively leave money on the table. The business would have to at least wait until it had enough tax liability to claim the subsidy. Several past investors in LIHTC properties, including Fannie Mae , learned firsthand how illiquid their LIHTC investment actually was after the 2008 financial crisis. With the lower corporate rate and other favorable provisions that are coming out of the new tax law, some firms that previously may have found the investment profitable may well reconsider. Even firms that expect to have large profits may now have greater uncertainty about their future taxes as they work through the 1,100-page bill . The increased risk could cause firms to value less any future reductions in their tax liability. The owner of an LIHTC project, like owners of all residential buildings, gets to deduct the building’s depreciation over a 27.5-year schedule. These depreciation allowances, coupled with LIHTC rental restrictions and relatively high operation costs due to compliance with those restrictions, often result in large expected tax losses that go beyond the allocated tax credits. For example, the $10 million apartment building mentioned above would be expected to generate more than $290,000 in depreciation allowances a year that outside investors not limited by passive-loss restrictions (such as C corporations) could use to offset other taxable income. The reduction in the corporate rate from 35 percent to 21 percent would lead to about a $626,000 decrease in outside investors’ willingness to pay developers for those deductions under reasonable assumptions. (A potential headache is that depreciaton allowances are subject to recapture if the project is eventually sold for more than tax basis. This provision rarely needs to be enforced.) This represents a 5.9 percent reduction in the overall valuation of the investment, which could require additional debt on the property and perhaps make some projects no longer feasible. At the same time, lower taxes should expand the supply of market-rate housing. Only a small fraction of low-income households occupies newly built, rent-capped homes produced under the LIHTC. Most of these households use their own earnings or HUD vouchers to pay the market rents for older, existing apartments. A recent study by Stuart Rosenthal in the American Economic Review showed that while newly constructed units are often unaffordable for most households, they eventually supply the majority of future low-income affordable housing. This "filtering down" occurs as a result of physical depreciation or shifts in style or location preferences. If lower taxes generate new market-rate construction—and thus increase the aggregate supply of housing—these lower taxes should lower rents throughout the market or increase landlord participation in HUD voucher programs. Eriksen and Lang suggest two changes to the LIHTC program that would increase the supply of affordable housing produced under the program without increasing tax expenditures. The first, and most immediate, would be simply to make the allocated tax credits through the LIHTC program refundable, because uncertainty about future tax liabilities reduces both the pool of otherwise eligible investors and the market value of allocated tax credits. Making this change would also give some developers at least the option of claiming the credit themselves rather being forced to partner with outside investors. The second change would allow developers to claim an actuarially equivalent subsidy over a shorter time period than the currently required 10 years. Developers and LIHTC investors are thought to have a much higher cost of capital than the federal government. In the extreme, allowing developers to claim the full value of refundable tax credits when projects are completed would give them the greatest flexibility in financing their projects. Increasing the supply of housing affordable to low-income families could be achieved using other policies that focus on reducing other barriers to increasing housing production, like state and local zoning laws that limit the location and density of multifamily housing. A bill working its way through the California legislature would appear to be in this spirit. Chris Cunningham is a research economist and associate policy adviser at the Federal Reserve Bank of Atlanta; Mike Eriksen is associate professor of real estate in the Linder College of Business at the University of Cincinnati. The views expressed here represent those of the authors and not the Federal Reserve Bank of Atlanta or the Federal Reserve System. In a recent post, we described the outlook for housing growth in the Atlanta Fed's district as "slow and steady." In this post, we look at what other Fed districts are hearing about housing growth and attempt to reconcile those anecdotes with recent signs from the Atlanta Fed's GDPNow. The most recent Beige Book characterized residential real estate activity as "constrained across the country." Of the 12 districts, only one (the Federal Reserve Bank of Chicago) raised its classification of the pace of residential construction, and five lowered their assessments. The other districts remained at little or no change, including San Francisco, whose pace was still strong despite shortages of land and labor. Indeed, several districts cited tight labor conditions as limiting new construction. With labor and, to a certain extent, land market conditions holding back construction, we might expect the prospects for residential fixed investment (RFI) in the fourth quarter of 2017 to be dreary. 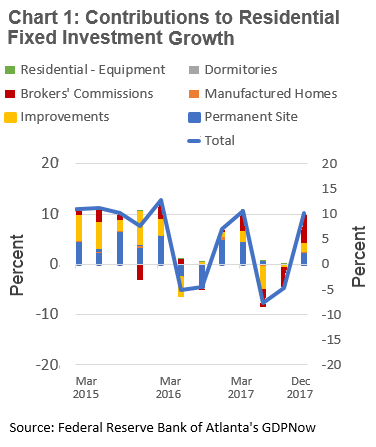 However, recent releases of GDPNow indicate that residential fixed investment should make a relatively strong contribution to fourth-quarter real GDP growth after being a drag in the second and third quarters (see chart). Interestingly, brokers' commissions are making the largest contribution to RFI, followed by permanent site (single and multifamily construction) and improvements. The increase in brokers' commissions reflects the increase in the real value of home sales that resulted from the acceleration of house prices as well as from a sharp increase in the number of existing and new home sales reported for October and November 2017 (see chart). An increase in both house prices and the number of houses sold is consistent with strength in housing demand. We look to the supply of housing to understand the Beige Book's description of constrained real estate activity. Housing inventory provides an indication of supply conditions. Eleven Fed districts reported that residential inventory conditions were tight (the remaining district did not mention inventory). Several stated specifically that low inventory was restraining sales and that the low number of available houses is putting upward pressure on house prices. Constrained residential real estate and construction activity does not mean that the sector is doing poorly. It just means that, the housing market's positive contribution to economic activity could be greater if land and labor market conditions were more favorable. The national Beige Book comments are consistent with our view of housing sector conditions in the Southeast—specifically, that supply-chain constraints imply that near-term residential investment growth will be steady and measured. One element that has distinguished the expansion following the Great Recession from expansions following prior recessions is the slow recovery of the housing sector. 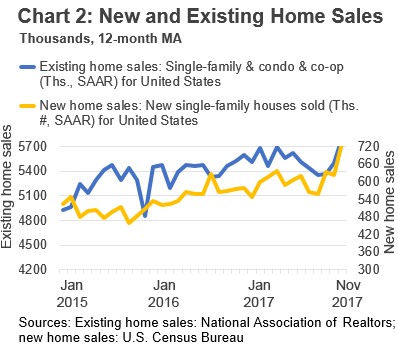 Recent data releases relating to home sales activity and new construction point to a housing market that continues to grow at a slow but steady pace. Single-family starts are increasing but remain low by historical norms. According to the U.S. Census Bureau, the 12-month moving average of multifamily starts has peaked after increasing steadily over the last several years. The data releases since the initial fourth-quarter GDPNow nowcast on October 30 have, on net, brightened the outlook for residential investment. These numbers tell us where we are but not what lies ahead. To supplement official data releases, the Atlanta Fed collects anecdotal information from market participants. This information helps us detect shifts in trends and concerns that may influence the future direction of housing. Results from our recent industry forums and surveys indicate that (1) we should expect more of the same slow, steady growth, and (2) there are downside risks to the outlook. On December 1, in conjunction with the Georgia State University Department of Real Estate , the Atlanta Fed held a Real Estate Industry Forum to discuss current trends and challenges facing the real estate industry. The good news from the panel of chief economists was that demographics—especially with millennials entering the age of household formation and house purchasing—and other underlying fundamentals, such as employment growth and tight inventory, continue to support an optimistic outlook for housing demand. The supply of housing is where most of the concerns sit. The industry forum panelists noted that some geographies face supply constraints that will hinder the delivery of housing sufficient to match increased fundamental demand. Such observations are consistent with responses we received in our November 2017 Construction and Real Estate Survey. In the poll, most builders reported labor cost increases from the year-ago level; nearly two-thirds of respondents said labor costs had increased more than 3 percent. All builders said material costs had increased over the same period. Many continued to note that the amount of available credit for construction and development remained insufficient to meet demand. Builders said they expect construction activity over the next three months to be flat to down. When asked if they would be able to meet a sudden spike in demand for homes, Southeast builders' responses were split: 46 percent said they would not be able to handle the spike in the demand, while 38 percent said they would. Most builders indicated they faced challenges with hiring and that it was affecting their ability to grow their businesses. Of those experiencing difficulty hiring, more than half attributed it to the homebuilding industry—that is, too much demand for construction laborers or too few workers. One-fifth attributed the labor shortage to workers lacking the necessary skills set. The responses to open-ended, follow-up questions reiterated these findings; respondents cited lack of skills and poor work ethic as the top challenges to finding quality workers. One interpretation of builders' inability to grow their business or respond to a spike in demand is that the market is near equilibrium. That is, production is at a point such that increasing the scale of operations is not profitable, and scaling back production does not improve profitability either. Improving the supply of labor can be done, but will take time in terms of training and skill acquisition. The timing and extent to which the access to financing can be improved is less known. While underlying fundamentals support an optimistic outlook for the housing sector, supply chain constraints imply only measured near-term residential investment growth.